When you look in the mirror, the skin that you see is actually old and ailing. The cells that are visible today are due to be shed in the days to come, so that your skin can continue to renew itself and remain in good health. This natural shedding process is always occurring, but in many cases, it just doesn't happen fast enough, meaning that old skin remains on the surface of the complexion for longer than is necessary. Exfoliation is the process of removing some of this dead skin and making the newer, healthier skin below it visible. There are many ways that you can get the benefits of exfoliation. You can apply a scrub, or you can use a product that contains a chemical exfoliator like glycolic acid. 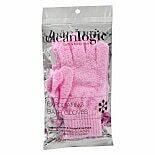 Using exfoliating gloves is another option that many people prefer, especially for exfoliating the body skin. You'll find different types of exfoliating gloves to meet your skin care needs and help you boost cellular turnover rates in the skin care department at Walgreens. Exfoliating gloves are typically designed for use in the tub or the shower, and most are intended for use on the body skin as opposed to the face. The gloves have a rough surface that creates friction when you rub your hands along your body. This loosens cells on the outer layer of skin, so that the water in the tub or shower can wash them away. Removing dead skin with exfoliating bath gloves can help it feel smoother, look more radiant and be softer to the touch. With exfoliating gloves, you can also rub your skin to help promote circulation to the tissue or gently remove some of the damaged skin from areas of wrinkling or discoloration. Using exfoliating gloves before you apply certain depilatories and other hair removal products or prior to using a sunless tanner can even help you to get better results from your body care treatments. Find the right exfoliating gloves for you in the Walgreens skin care department and start getting all of the benefits of easy, convenient exfoliation!